I have moved my blog using the instructions How to Move from blogger to wordpress with permanent 301 redirection provided by Aaslin Sathrak on SenseHow.com. In outline, I created a special template page on http://blog.cpjobling.org that redirects to a special WordPress page. This page interprets the redirected URL and finds the reference to the original blogger page permalink that was stored in the page metadata when I exported my blogger pages to WordPress. This is used to look-up the wordpress permalink for the relocated page and then WordPress is asked to issue an HTTP 301 Moved Permanently reponse that tells Google and others that the original blogger URL has now moved to WordPress. If all works well, I’ll be changing the title of this blog to Fresh and Crispy in a week or so. In the meantime, please let me know if you find any broken links. This statement from Eric Schmidt’s keynote at the Mobile World Congress 2011 as quoted by Charles Arthur in the Guardian Tech Blog as some key implications for the future of internet app development. He said some other things too, but this stood out for me. In my move from Blogger.com to this self-hosted WordPress there are a couple of things that I have had to do that I thought would be worth documenting. These fall into the general headings of Comments, Permalinks, Feeds, and Categories and Tags. Comments. I was using disqus.com as my commenting system. There’s a WordPress plugin for this but to move the threads to the new blog I had to use the URL mapping method. See Using the Migration tools from the disqus knowledge base. Permalinks. I prefer the rich permalinks to the default https://blog.cpjobling.me/?p=2 format. Plus they are closer to the permalinks used in Blogger. Feeds. I was using feedburner on my previous blog to manage my feeds. I added the Fd Feedburner Plugin to redirect my atom and comments feeds to feedburner. Categories and tags. When I transferred my posts from blogger.com (using the WordPress Blogger to WP tool) tags from blogger became categories in WordPress. I’ve been swapping these over gradually, but I have an awful lot of uncategorized posts to go over! The nice thing about WordPress categories is that if you are careful, you can arrange the main topics of your site into easy to find high-level headings. Each category can be a top-level menu item. 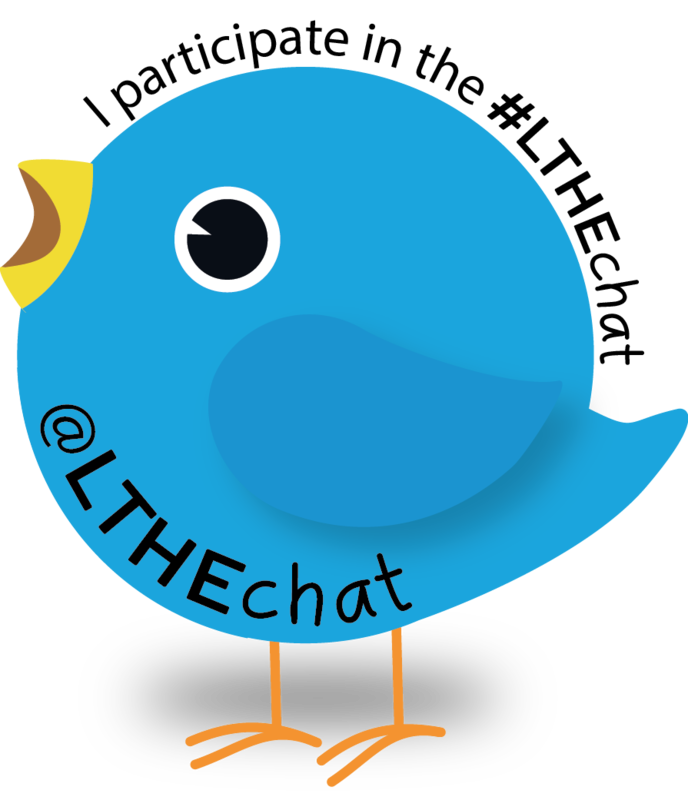 So far I’ve got Blog, Tools, Teaching, Courses, Podcasts, Research and Free Time. I’ll post more on this topic as I come across things worth reporting. 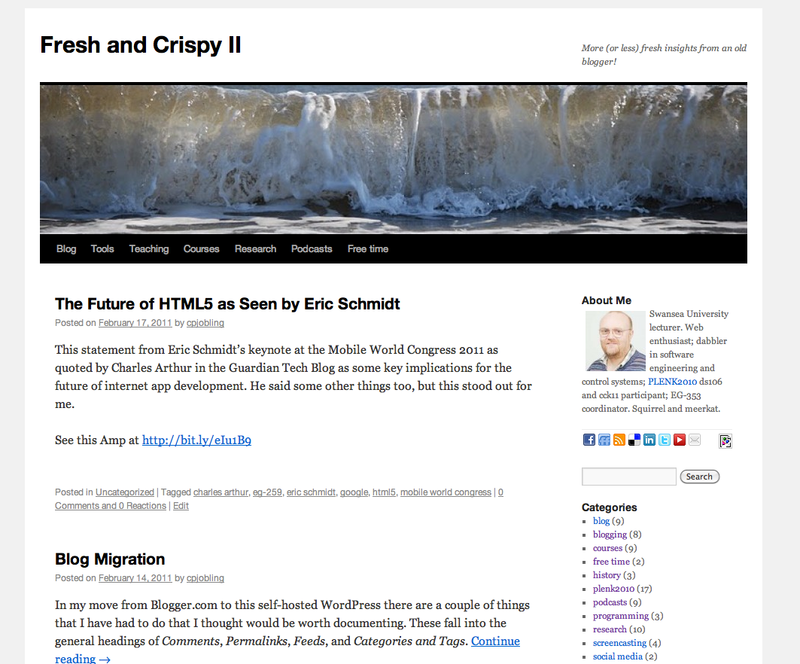 I’m planning to move Fresh and Crispy to this blog on the 1st March 2011. Consider this an early warning. Inspired by Jim Groom’s Digital Story Telling Course (DS106), I purchased this domain and it hosts my own WordPress blog. I’ve already exported my posts from Blogger.com and moved my disqus.com discussion threads over. Now it only remains to cut the cord. Until the cut-off point, I’ll be blogging in both places in parallel. After the 1st March, I’ll be posting only over here. I’ll keep the domain blog.cpjobling.org active as a historical record, at least until the domain comes up for renewal in a year’s time. My thanks to blogger.com for 7 years stirling service. I’ve just imported my posts from Fresh and Crispy on Blogspot using the WordPress Blogger blogs importer tool. Seems to have worked fine, but the comments in disqus.com where not carried over. I wonder if i) disqus.com can be used to manage comments in WordPress ii) If not, can comments be exported? In any case, I’m not yet ready to cut the cord! Answers i) Yes there’s a disqus plugin for wordpress and there’s a domain transfer tool. So that’s OK! Back in November, member of my social network Alan Cann asked me to participate in a project he was doing with the International Centre for Guidance Studies for the Research Information Network on Social Media for researchers. A few days later, I met online in Skype Chat with researcher Konstantia Dimitrou and we discussed my attitudes to social networking and its use in my teaching and scholarship. The report Social Media: A Guide for Researchers has now been released and you can read part of what I had to say on page 38 and in full on the Web at http://www.rin.ac.uk/node/1015. The report itself is well worth a look, particularly if you think research should be done the way it has always been done. Social media may be a way to raise your REF impact numbers if nothing else.